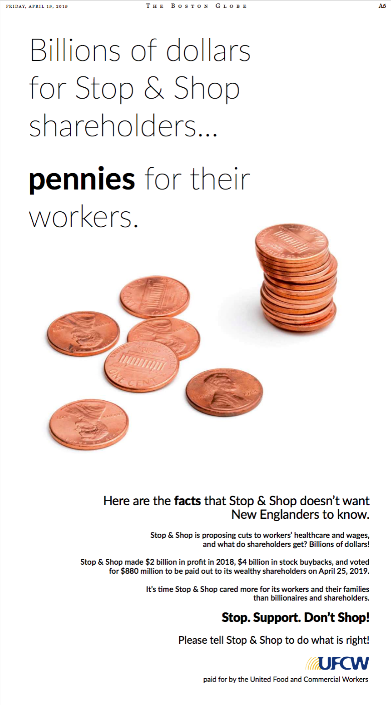 During the 10-day strike by roughly 31,000 Stop & Shop workers the past couple of weeks, the supermarket chain ran a series of ads like this one in the Boston dailies. 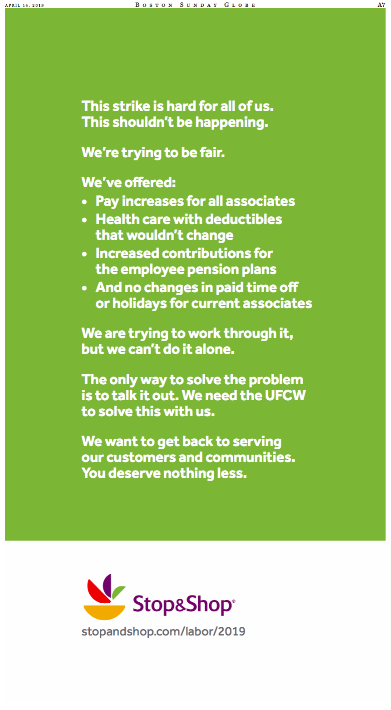 Last Friday the five locals of the United Food and Commercial Workers responded with this clearly superior ad in the Boston Globe. The UFCW won not only the ad battle, but the contract skirmish as well, as Globe reporter Katie Johnston details on Page One of today’s edition. If members of the five union locals approve — voting starts later this week — new part-time workers would get lower pension contributions and would not be guaranteed time-and-a-half pay on Sundays and holidays during their first three years, as other workers are, according to the union. In a workforce largely made up of part-timers, this is not an insignificant change. UMass Amherst labor studies professor Tom Juravich agreed, noting that 75% of loyal shoppers stayed away during the strike and the company lost $2 million a day. “That kind of leverage is unprecedented since the golden years of auto and steel,” he told Johnston. So it was, well, interesting to see this ad also run in today’s Globe. Sorry, fellas. 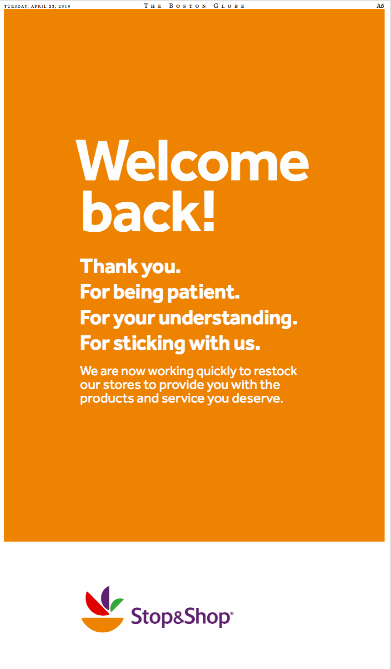 Your customers were neither patient nor understanding. And they definitely did not stick with you. You got your ads kicked. Now that the Teamsters have gone out in sympathy with the nearly 31,000 Stop & Shop workers who went on strike three days ago, management is apparently looking for some sympathy of its own. Thus, this full-page ad in today’s Boston Globe. Here’s their website if you want more of management’s side. One thing they do not address is why they didn’t run the ad in the Boston Herald. Afraid the readership is too union-friendly and an ad addressed to them would be a waste of money? Or just oblivious to the thirsty local tabloid, like so many others in this town. Whatever, let’s hope those readers stop shopping at Stop & Shop. For good. A sharp-eyed Two-Daily Town reader posted this on Facebook last night. Sure enough, this piece was sitting up like tee-ball on the Globe’s website. The Green Monster has a new logo, just in time for the Red Sox home opener. 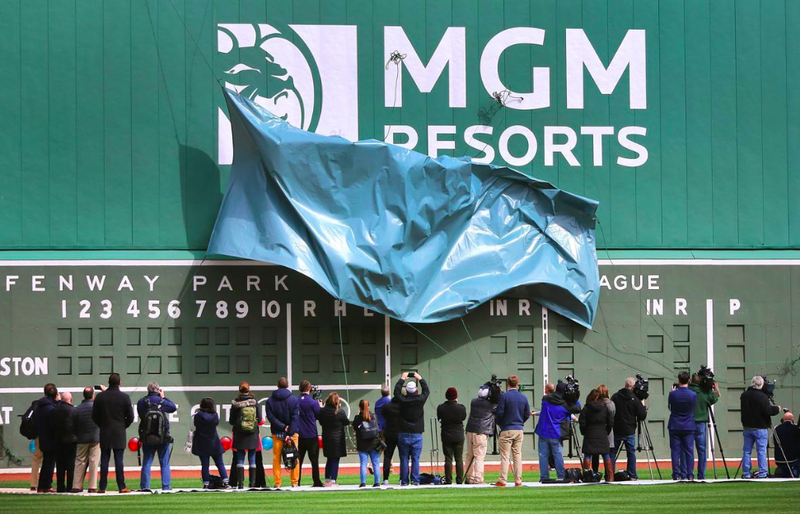 A large advertisement featuring MGM Resorts’ roaring lion trademark was unveiled at Fenway Park Friday, courtesy of a new partnership between the team and the casino giant. 1) Nowhere in that piece – or in the print version – is it disclosed that the Boston Globe is owned by Red Sox owner John Henry. 2) The piece was written by a Globe correspondent – not a staffer – who is presumably blameless in this matter and so will go unnamed. But the correspondent’s editors – they’ve got some ‘splaining to do, no? You are currently browsing the It's Good to Live in a Two-Daily Town blog archives for April, 2019.